Using the latest available case-by-case court records, current through May 2018, this report examines the outcome of custody hearings before immigration judges. At custody hearings, the judge decides whether or not the immigrant can be released from ICE custody after posting a bond. Both the likelihood of having bond motions granted, as well as the dollar amount of the bond required, varied markedly from one court location to another. In recent years somewhat over one in four detained individuals were ultimately successful in obtaining an Immigration Court custody decision that allowed them to be released by posting a bond. 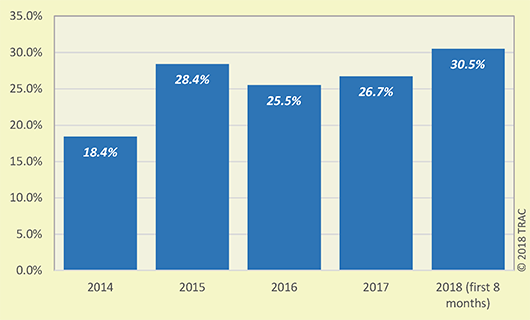 So far this year, this success rate has been 30.5 percent, up from 18.4 percent during FY 2014. See Figure 1. This increase occurred primarily because more and more of those detained are receiving custody hearings. Judges have been actually no more willing to grant bond at these hearings. During FY 2014 in slightly less than half the cases (48.8%) were bond motions granted. A slightly lower proportion (47.1%) have been granted during FY 2018. Nationally, for bond hearings thus far during FY 2018, the median bond amount set was $7,500. This amount is up by 50 percent from the median of $5,000 five years ago. A median bond amount of $7,500 means half of all individuals who were successful in having their motions granted had to post a bond of $7,500 or more. Nearly 40 percent had to post a bond of $10,000 or more. Five percent had their bond amount set at $25,000 or more. Only 1 percent were released without having to post a dollar bond. And only one in twenty had a bond amount that was less than $2,500. See Table 1 for details on bond amounts at the end of this report. This year there was also a three-fold difference in the median bond amount set depending upon the particular Immigration Court that decided the matter. Median bond amounts ranged from a low of $5,000 to a high of $15,000 depending upon court location. The highest median bond amounts were required by the Tacoma, Washington Immigration Court and the Hartford, Connecticut Immigration Court. The grant rate on custody hearings also varied markedly from one court location to the next. At one location only one out of six bond motions were granted. In other locations, around three-quarters of the bond motions were granted. The highest grant rate in the country among courts deciding at least 50 custody cases was in the California Immigration Court based in Imperial. Three out of four of the 1,072 cases with bond hearings had their motions granted. The median bond amount set, however, was $12,000 - fourth highest in the country. The next highest grant rate took place in the Florence, Arizona Immigration Court. There immigration judges granted 73.1 percent of bond motions - roughly comparable to the success rate in the Imperial Court. However, bond amounts were markedly lower. In Florence the median bond amount was $8,000 - a third less. The other extreme, with the lowest grant rate at bond hearings, occurred in Charlotte, North Carolina. Immigration judges in Charlotte granted only one out of every six (17.8%) bond motions. When bond was granted, the median amount was the same as in Florence -- $8,000. In Orlando, Florida, immigration judges had the second lowest grant rate on bond motions - just 26.9 percent. However, median bond amounts set were among the lowest in the country - just $5,000. See Table 2 at the end of this report for details on bond decisions at individual Immigration Courts. While there was some variation by nationality in bond outcomes, sharp locational differences persisted irrespective of the nationality of the immigrant seeking release from custody. What mattered the most was which court ruled on their motion. For example, outcomes depending on court location for Mexicans varied from a success rate of 67.5 percent all the way down to only 15.3 percent. The differential for those from Guatemala - the nationality with the second largest number of bond hearings - was even greater. Depending on court location, bond grant rates for Guatemalans ranged from 84.7 percent down to only 14.4 percent. More information is needed before the factors that give rise to these differences can be fully understood. We do not know, for example, the extent to which ICE policies on custody differ by detention facility, or whether bond amounts set by ICE vary markedly by location. This could influence whether an individual finds it necessary to seek a bond hearing before an immigration judge, as well as what ICE argues at the hearing is a suitable or necessary bond level. The composition of detainees as well as the relative availability of representation at some detention locations, among other factors, may also make it more or less challenging for immigrants to prepare and file successful bond motions. And different judges are based at each court location. * Where an individual had their custody reviewed more than once, the outcome at the last custody hearing is used. ** Covers the first 8 months of FY 2018 (through the end of May). * Courts with at least 50 custody hearing cases from October 2017 - May 2018. A few - typically fewer than 1% -- of these are released on their personal recognizance which may impose other conditions but not require posting a bond. For those granted bond, having a bond set still was not synonymous with being released. While figures varied from year to year, previous TRAC research found about one in five remained detained at the conclusion of their case, presumably because they were unable to post the amount of the bond.